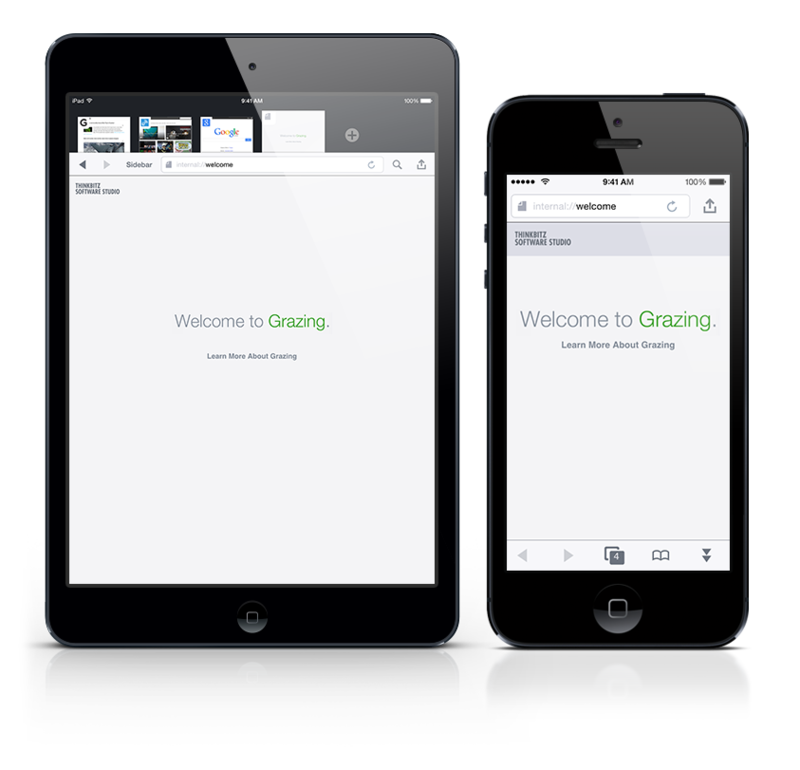 Grazing was an advanced web browser for iOS. Note: Grazing is no longer available. This page is maintained as an archive. 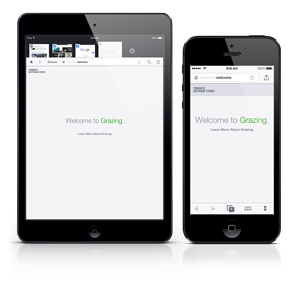 Version 3.1.2 will likely be the last release of Grazing. It will require significant effort to update it to support future versions of Apple's development tools, and there aren't really enough users to support it, so I think it's time to say goodbye. The app should keep working for the foreseeable future, and existing users will still be able to download it from the App Store. Eventually, an iOS update will probably do something that will break it, but hopefully it will keep working for at least a few more years. Grazing Cloud has been removed from the app. If you have any bookmarks you'd like to save, please visit grazingcloud.com before April 30, 2018. All user accounts and data will be deleted shortly after that date. Thanks for your support over the years! It means a lot to me that people have kept using it for so long. Lots of sharing actions and page options. Manage your tabs any way you like. Fullscreen mode with gesture controls. Cloud sync for tabs and Chrome bookmarks. Thumbnail tabs on both iPhone and Tablet. Long-press-and-swipe on links to open them in background tabs. 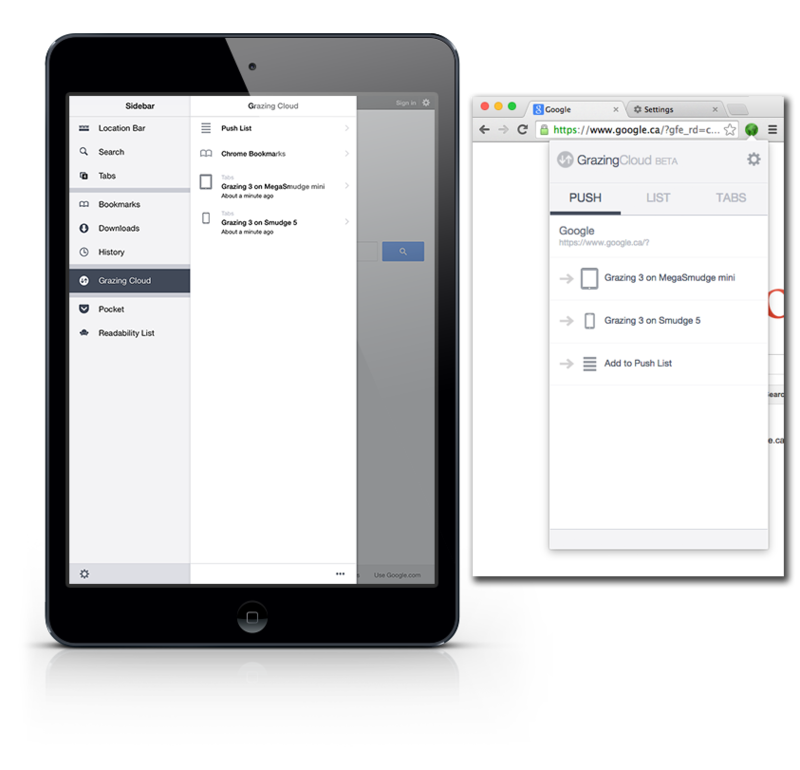 Swipe in from the sides for a variety capabilities, including a thumb menu, back/forward navigation, tab switching, or to access bookmarks. Quick draw gestures directly on the web surface to close pages, go back in the history, and more. Hostname-based adblocking keeps your webpages fast and uncluttered, and Do Not Track tells advertisers you don't want to be tracked. Click on the favicon to change pages font size and desktop mode, plus you can save your sizes and browser modes for specific sites. Options to clear or exit Private Browsing after specific times out of the app. On the iPhone, use the handy Page Down button to quickly navigate pages. On the iPad, use the Touchpad to quickly page down and switch tabs. Reopen recently closed tabs (with full browsing history), and sort tabs manually. Choose Save Form from the Actions menu to securely save form entries, usernames, and passwords. View an optimized view of the current page from Readability or Instapaper Mobilizer. Add an item to Readability, Instapaper, Pocket, Delicious, Pinboard, or the built-in Grazing Cloud list. Access your reading lists from Pocket or Readability. Download files from sites, and open them in any supported app on your device. On iOS 8, upload to iCloud Drive, Dropbox, or any other app that supports file extensions. 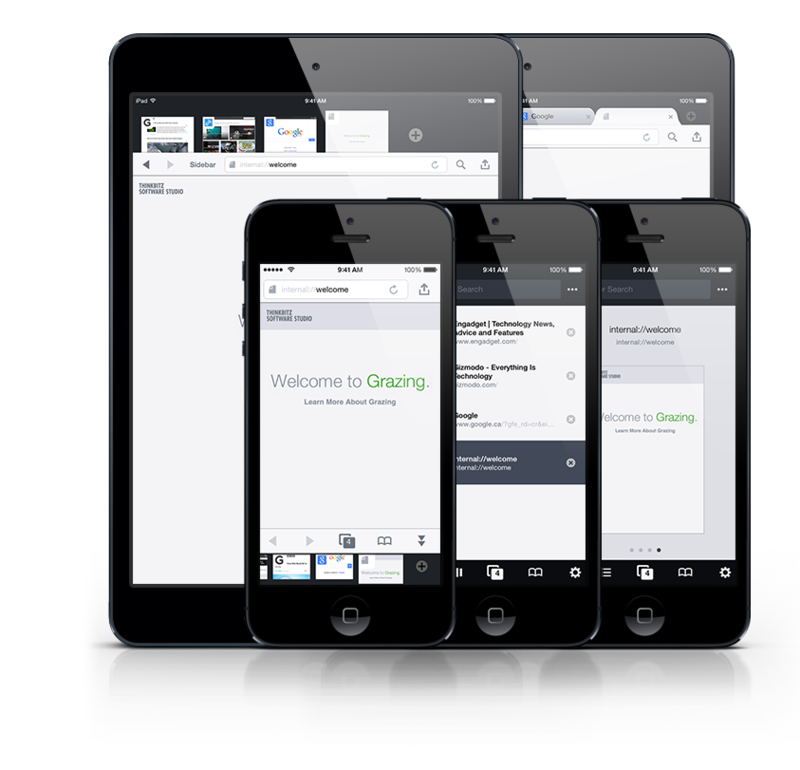 Use Grazing Cloud to sync tabs from Grazing to your desktop Chrome or Safari browser. Instantly push links from your desktop browser to Grazing, or from Grazing back to your Mac. Easily upload bookmarks from your desktop Chrome browser, or import bookmark files. Share links with Twitter, Facebook, Tumblr, LinkedIn, Google+, or any iOS 8 sharer. 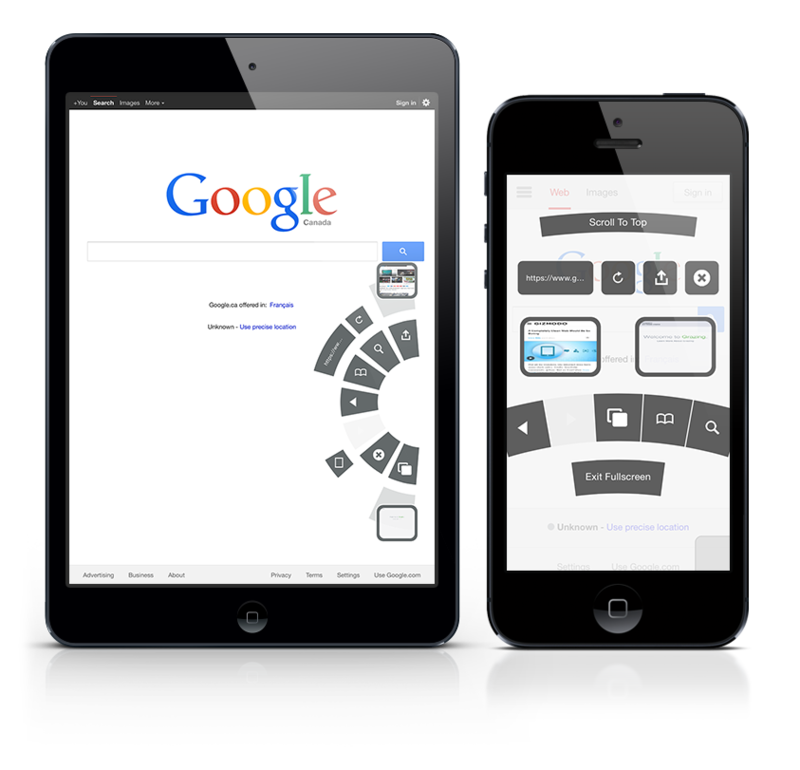 Quickly send links to view the Google Cache, Google Translate, the Wayback Machine, or View Source, or iOS 8 services. Grazing 3 is no longer available.